Also serving communities of Morton Grove. There are 26 Assisted Living Facilities in the Glenview area, with 2 in Glenview and 24 nearby. The average cost of assisted living in Glenview is $6,261 per month. This is higher than the national median of $3,346. Cheaper nearby regions include Northbrook with an average starting cost of $5,872. To help you with your search, browse the 194 reviews below for assisted living facilities in Glenview. On average, consumers rate assisted living in Glenview 4.4 out of 5 stars. Better rated regions include Northbrook with an average rating of 4.5 out of 5 stars. Caring.com has helped thousands of families find high-quality senior care. To speak with one of our Family Advisors about assisted living options and costs in Glenview, call (855) 863-8283. Located just northwest of Chicago, Glenview is a city that's ideal for seniors who enjoy a quiet daily life but don't want to give up all the amenities that come with living in a big city. While the city is moderate in size, it has a fairly large senior community. Seniors age 55 and older make up 35.2 percent of Glenview's 47,475 population. Twenty-five assisted living facilities in the area accommodate the aging population. One is located within the Glenview city limits, and 24 are located in nearby communities. As with facilities in the rest of Illinois, Glenview assisted living facilities are regulated by the Illinois Department of Public Health. The PACE bus system serves the Glenview area. The Regional Transit Authority, Chicago Transit Authority and Metra all connect with the PACE bus routes, making it easy for seniors to travel around town or go to and from Chicago. The Illinois Department on Aging's Benefit Access program allows qualified seniors age 65 and older to use the area's public transportation for free. PACE also offers a paratransit service for seniors who require door-to-door transportation. Many retirees consider Illinois a tax-friendly state. Withdrawals from retirement accounts, including 401Ks, pension payments and Social Security income isn't taxed at all. However, food and medicine are taxed in Illinois at a state rate of 1 percent, plus additional local tax rates up to 1.25 percent. The weather in Glenview is fairly moderate for most of the year. High temperatures in the summer months rarely exceed the mid-80s, making it easy for seniors to enjoy their favorite outdoor activities. The winter weather may be difficult for some seniors, though. In January, low temperatures dip down to around 21 degrees, and the city normally gets snow. Seniors on a low or fixed income might find life in Glenview a bit difficult. The city's overall cost of living is 48 percent higher than the national average. Fortunately, groceries and health-care costs are only slightly above the national average, at 8 percent and 1 percent, respectively. This may make it a bit easier to find affordable prices on necessities. Seniors concerned with safety can appreciate Glenview's low crime rates. The city has an overall crime rate that's 45 percent lower than the Illinois average and 52 percent lower than the national average. When it comes to violent crimes, Glenview's crime rate is 80 percent lower than the state average and 78 percent lower than the national average. The Glenview area is home to world-class medical facilities, including Northshore University Health Systems - Glenview Hospital, in the event of medical emergencies or illness. Assisted Living costs in Glenview start around $6,261 per month on average, while the nationwide average cost of assisted living is $4,000 per month, according to the latest figures from Genworth’s Cost of Care Survey. It’s important to note that assisted living rates in Glenview and the surrounding suburbs can vary widely based on factors such as location, the level of care needed, apartment size and the types of amenities offered at each community. 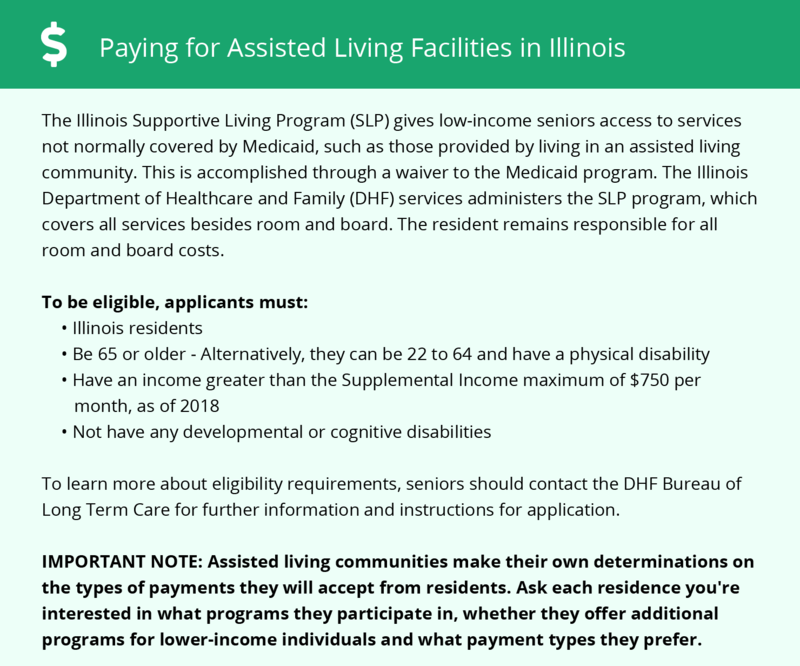 Illinois offers an optional state supplement program to help low-income seniors pay assisted living costs. Seniors who need financial assistance can also apply for the state's two Medicaid waiver programs — the Managed Long-Term Services and Supports program and the Supportive Living Program. Glenview and the surrounding area are home to numerous government agencies and non-profit organizations offering help for seniors searching for or currently residing in an assisted living community. These organizations can also provide assistance in a number of other eldercare services such as geriatric care management, elder law advice, estate planning, finding home care and health and wellness programs. To see a list of free assisted living resources in Glenview, please visit our Assisted Living in Illinois page. Glenview-area assisted living communities must adhere to the comprehensive set of state laws and regulations that all assisted living communities in Illinois are required to follow. Visit our Assisted Living in Illinois page for more information about these laws.